Sliding, diving, rolling down hills; however they chose to obtain first place, trail runners from 10 states and Canada joined in what some call “trail running mania” as they maxed out their physical abilities to compete in this year’s Rock/Creek Trail Series, Chattanooga Mountain Stage Race, presented by SmartWool. Featuring three bug-biting, dirt-grinding mountains in the Chattanooga, TN area, this 60 mile course is the hardest three-day race to be found in the Southeast. With over 200 participants- roughly twice last year’s number- the competition has risen significantly as the leaders spent three days yo-yo-ing each other’s pace to end up on the podium. Our elite top finisher’s incredible athleticism and running talent for the 2010 Chattanooga Mountain Stage Race was evidenced by the incredible times these runners put in the record books. Every men’s podium finisher broke a record for the race in 2010 compared to 2008 and 2009’s winning times. Dane Mitchell, from Birmingham, AL, took first with a remarkable combined time of 7:31:43. Josh Wheeler from Signal Mountain, TN took second with a combined time of 7:39:42 and Owen Bradley from Birmingham, AL took third overall with a time of 8:18:41. 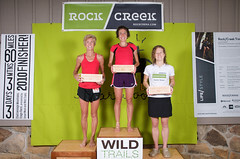 All three men are Rock/Creek Race Team Members, making the podium a very friendly place to stand. The men’s race wasn’t the only highly competitive field. After capturing a podium spot in the Women’s division for each of three individual stages, Emily Ansick from Auburn, AL took first with a combined time of 9:52:11. After winning either first and second place for each individual stage, Sue Kelly from Atlanta, GA took second female overall with a combined time of 10:23:33. Rock/Creek Race Team Member, Natalie Sims, gradually worked her way up the ranks for a third place combined finish of 10:35:13. Other distinguished finishers include those in the Masters division. 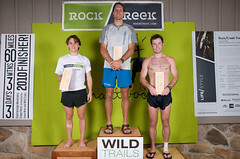 Rock/Creek Race Team Member, Johnny Pryor from Nashville, TN, took first with a combined time of 9:34:59. The female master’s winner, Kim Nosenchuk-Brooks from Marietta, GA, finished with a cumulative time of 11:40:04. This is now the new course record for female masters’ finishers. Randal Whorton was also awarded a special prize for being the oldest runner so far to finish all three days at age 70. The race has been designed to showcase the best of Chattanooga trails, so the big three mountains are covered: Lookout, Raccoon, and Signal. Day one on Lookout starts on the Lula Lake Land Trust and includes the Covenant College Cross Country course. The second day takes runners to the beautiful TVA Raccoon Mountain Pumped Storage Facility, where SORBA-Chattanooga has built trails around the reservoir with stunning views of the Tennessee River Gorge. Day three elevates the scenic beauty, starting at Signal Mountain Middle/High School and running along the Cumberland Trail. With participant numbers double last years’ and stories and comments like these coming in, Rock/Creek and SmartWool will continue enhancing the Stage Race experience alongside other races in the Rock/Creek Trail Series. New in 2010 are videos covering personal testimonies and Trail Series race experiences, captured by Andrew Kornylak. Also new for the stage race: local Adventure Photographer, Sam Silvey, came to the Sunday’s Stage Race events to take Finishers Portraits on the new podium crafted and donated by Jason Glen from Artisant Homes. Proceeds from the Chattanooga Mountains Stage Race, presented by SmartWool, benefit local non-profits. The race would not be the same without the help of volunteers from Rock/Creek and the community, and the following additional sponsors: Patagonia, Marmot, Salomon, Hammer Nutrition, Greenlife Grocery, Trail Runner Magazine, Archer Physical Therapy. Follow Uncle Dan's and Rock/Creek on social media for updates on the best deals, latest news, and seasonal tips.